Who are the candidates in May’s Amber Valley Borough Council election? Counting takes place at Alfreton Sports Centre during last year's general election. Voters in Amber Valley go to the polls on May 5 in the first major test of electoral opinion in the area since the General Election. 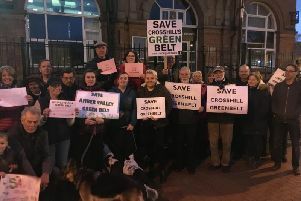 They will be voting to elect councillors to Amber Valley Borough Council, which is currently controlled by the Conservatives who have 24 seats to Labour’s 21. In total, the council has 45 councillors representing 23 wards. Alfreton: Marlene Bennett (Lab), Henry Foulds (Lib Dem), Kat Moss (Con), Leo Swavett (Green), Pete Twiname (UKIP). Belper Central: Dave Fisher (Ind), John Nelson (Con), Maurice Neville (Lab), Dave Wells (Green), John Young (UKIP). Belper North: Ben Bellamy (Lab), Alan Cox (Con), Sue Macfarlane (Green), Richard Salmon (Lib Dem), Dennis Smith (UKIP). Codnor and Waingroves: Jackie Blackett (Green), Linda Edwards-Milsom (Con), Christopher Emmas-Williams (Lab), Gaz Smith (UKIP), Fay Whitehead (Lib Dem). Heage and Ambergate: Ian Gillat (UKIP), Paul Lobley (Lab), William Macfaralane (Green), Angela Ward (Con), Audrey Wootton (Lib Dem). Heanor and Loscoe: Geoffrey Aldwinckle (UKIP), James Brooks (Green), Kieran Hill (Lab), James Morton (Lib Dem), Julie Whitmore (Con). Heanor East: Mark Burrell (Con), Sheila Oakes (Lab), Philip Rose (UKIP), George White (Lib Dem), Julie Wozniczka (Green). Heanor West: Teresa Curran (Lab), Chris Flude (UKIP), Steven Grainger (Con), Joel Hunt (Lib Dem), Mike Jones (Green). Ironville and Riddings: Stuart Bent (UKIP), Jack Brown (Con), Steve Kennedy (Green), Ollie Smith (Lib Dem), Paul Wardle (Lab). Kilburn, Denby and Holbrook: Charles Bull (Con), Kate Howard (Green), Roy Snape (UKIP), Christine Venables (Lab), Ron Welsby (Lib Dem). Langley Mill and Aldercar: Brian Gration (Lab), Timothy Knowles (National Front), Christina Smith (Green), Ruth Thornton (Lib Dem), Tony Warren (UKIP), Rosie Webster (Con). Ripley and Marehay: Matt Murray (Con), John Pass (UKIP), Michael Sharpe (National Front), Clym Stock-Williams (Lib Dem), Mick Wilson (Lab), Tony Youens (Green). Ripley: Sean Carter (Con), Tony Holmes (Lab), Peter Jelf (Lib Dem), Paula Parkin (UKIP), Phil Taylor (Green). Shipley Park, Horsley and Horsley Woodhouse: Matt McGuinness (Green), Ade Nathan (UKIP), Kate Smith (Lib Dem), Alexander Stevenson (Con), Antony Tester (Lab). Somercotes: Colin Boyce (Con), Steve Elliott (Green), John McCabe (Lab), Paul Price (UKIP), Elsie Situnayake (Lib Dem).